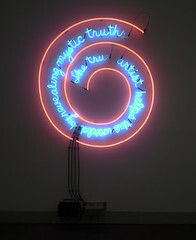 By using the mediums of mass culture (neon signs) and of display (he originally hung the sign in his storefront studio), Nauman sought to bring questions normally considered only by the high culture elite, such as the role and function of art and the artist in society, to a wider audience. While early European modernists, such as Picasso, had borrowed widely from popular culture, they rarely displayed their work in the sites of popular culture. For Nauman, both the medium and the message were equally important; thus, by using a form of communication readily understood by all (neon signs had been widespread in modern industrial society) and by placing this message in the public view, Nauman let everyone ask and answer the question. While it is perhaps the words that stand out most, the symbolism of the spiral (think of Robert Smithson’s Spiral Jetty, 1969), also deserves attention having been used for centuries in European and other civilizations, such as megalithic and Chinese art, both as a symbol of time and of nature itself. Theosophy is interesting in this regard and was an important aspect of the early European Avant-garde. In particular, Theosophists believed that all religions are attempts to help humanity to evolve to greater perfection, and that each religion therefore holds a portion of the truth. Through their materials, artists had sought to transform the physical into the spiritual. In this sense, Malevich, Mondrian, and Kandinsky sought to use the material of their art to transcend it: Nauman, and other of his generation, did not. Instead, Nauman’s work transgresses many genres of art making in that his work explores the implications of minimalism, conceptual, performance, and process art. In this sense we could call Nauman’s art “Postminimalism,” a term coined by the art critic Robert Pincus-Witten, in his article “Eva Hesse: Post-Minimalism into Sublime” (Artforum 10, number 3, November 1971). Artists such as Nauman, Acconci, and Hesse, favored process instead of product, or rather the investigation over the end result. 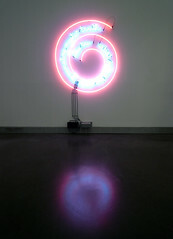 However, this is not to say they did not produce objects, such as the neon-sign by Nauman, only that within the presentation of the object, they also retained an examination of the processes that made that specific object. 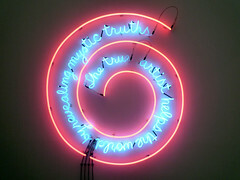 This type of logic and analytical thinking was influenced by Nauman’s reading of the philosopher Ludwig Wittgenstein’s Philosophical Investigations (1953). From Wittgenstein, Nauman took the idea that you put forth a proposition/idea in the form of language and then examine its findings, irrespective of its proof or conclusion. Nauman’s “language games,” his neon-words, his proposition about the nature of art and the artist continue to resonant in today’s art world, in particular with regard to the value we place on the artist’s actions and findings. 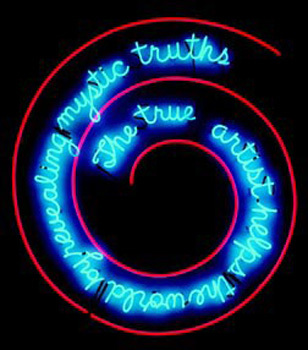 Cite this page as: JP McMahon, "Bruce Nauman, The True Artist Helps the World by Revealing Mystic Truths," in Smarthistory, August 9, 2015, accessed April 23, 2019, https://smarthistory.org/nauman-the-true-artist-helps-the-world-by-revealing-mystic-truths/.